View More In Binder Accessories. 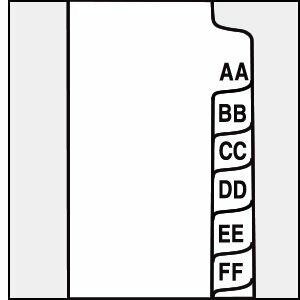 This is an AA-ZZ set of notebook dividers or a closing set made of 80 lb. white offset 100% recycled (30% post consumer waste). Buy in quantity and save. Also available in collated set of 26 letters A-Z. Individual letters A-Z are available in packages of 25 each letter. If you have any questions about this product by Blumbergs Law Products, contact us by completing and submitting the form below. If you are looking for a specif part number, please include it with your message.